Mend restoration strives to blend old world craftsmanship, state of the art technology and environmentally conscious philosophies to protect our architectural heritage for future generations. Mend Restoration can REnew, REstore or REcreate a wide range of surfaces. Mend is a full service heritage restoration company. Our talented team can rebuild heritage details from archive pictures, clean any stone or brick facade and repair damaged components or substrates. From eliminating graffiti to recreating masonry craftsmanship of a by-gone era, we have a solution to breathe new life into your property. Mend Restoration provides clean technology to preserve architectural structures and our living spaces. Though our primary focus is historical restoration, we do not limit ourselves to this scope of work. If you have a surface that requires maintenance, we have a solution. Our advanced cleaning technology utilizes a low pressure system, minimal water for dust containment and a inert blasting media that exceeds strict job site requirements and work safe standards. Our Rotec Vortex system and other processes can be utilized on wood, metal and stone surfaces for applications such as specialized cleaning, paint & graffiti removal and problematic efflorescence. When the decision has been made to restore rather then replace damaged components, our skilled technicians will determine the best methods and materials to use based on site conditions, budgets and timelines. Mend follows the ancient laws of stone masonry. We utilize the natural states of the materials while maintaining their integrity. Gone are the days of elastomeric coatings. Sealers and patches must allow the stone to breathe and transmit water vapour. 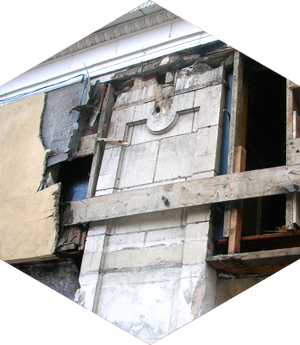 Our method of restoration implements bonding patterns and load distribution, respecting the natural flex and dynamics of building substrate and foundation. Our team of certified stone masons has been trained in the Jahn mortar repair system by Cathedral Stone. Jahn is recognized as a leader in the industry and fits with Mends environmental philosophies. When facade components are beyond repair, Mend employs state of the art technology and old-world craftsmanship to replicate historical design. Mend has revolutionized mold-fabrication. Through digital rendering, 3D scanning or in-house sculpting we can recreate any positive. Using five axis CNC milling or rapid pro-typing any digital file is materialized. We utilize our advanced understanding of substrate characteristics to select the perfect combination of materials, honouring mold intricacy and longevity. We are leaders in precasting concrete and progressive mix design. Ultra-high performance concrete has chameleon-like qualities providing unprecedented design opportunity while having the flexural strength to endure the elements. When elements have taken hold. We can bring it back to life. The ROTEC® VORTEX Cleaning Process is a wet-jet micro abrasive media process. This process converts or transforms energy from the wet jet into rotating energy by means of a uniquely-constructed patented nozzle. The combination of extremely low air pressure (from 10 to 55 psi) and minimal water (precisely regulated from 1 to 15 gallons per hour) nearly eliminates dust pollution. The rapid expansion of the vortex allows the pressure of the compressed air to dissipate while the rotation of the vortex continues unabated. Atmospheric pollutants, encrustations, corrosion, paints or coatings can all be cleaned successfully without damage to the surface. The Rotec Vortex process cleans natural stone such as sandstone, limestone, marble and granite. Variable characteristics of natural stone mean that severe demands are imposed on the cleaning process. Stone surfaces often display encrustation secondary to the effects of weather and the environment, this is very difficult to remove without damaging the substrate or the texture of the stone. Our unique cleaning process preserves the original surface, including carvings and tool marks. Manufactured stone such as brick and terra cotta can often be impossible to safely clean due to the protective glaze, this delicate operation is our specialty at Mend Restoration. Graffiti and efflorescence removal is extremely difficult to address with power washers or sandblasting equipment. The Rotec system can remove graffiti without leaving a halo around the tagged surface. 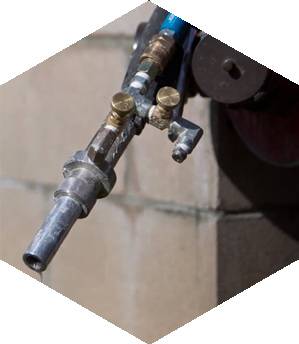 Efflorescence is safely removed without blasting out mortar joints or patching materials. Previously, the pollutants the damage wood required harmful strippers and aggressive pressure washers. The Vortex safely and effectively removes these pollutants, leaving the surface unharmed. At Mend Restoration, we will tackle almost any surface in British Columbia, Alberta or Western USA. Natural stone, brick, terra cotta, concrete, stuccos, wood and metals are often covered with a variety of paints, sealers, and other coatings. Even with chemical paint strippers, it can be impossible to remove these layers. Mend has the solution to address these challenges safety, without toxic chemicals. 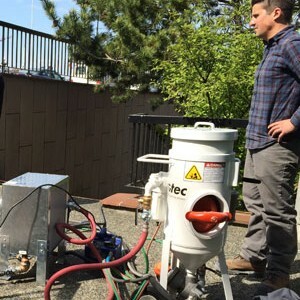 The Rotec system uses a combination of low psi and minimal water, which nearly eliminates dust and paint particulate during abatement. For example, paint removal on front entrance staircases is a perfect application for the Vortex. We can remove paint and grime in order to prime for natural stains, polishes or sealants revitalizing the concrete and bringing a whole new life to your entrance way. A patch is not just a patch. Successful remediation depends on the ability to match the porosity and hardness. If the filler material is of different density than the surrounding substrate, it will fail. Water travels through the path of least resistance. When mortar or patch is denser than the face of the masonry unit, water will travel through the face of the facade, causing spalling, efflorescence, cracking and/or discolouration. Mortar is the lubricant and lungs of the building. Moisture eventually leaches of the mortar joint and travels along the veining. 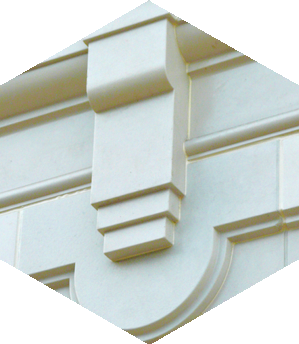 Mortar is designed to be a sacrificial material, to prevent deterioration of the facade. Mend uses colour matched, site specific, engineered mixes, that breathe, bond and ensure success. The entrance to your home or business makes your first impression. Through our affiliations with designers, landscapers and manufacturers, Mend Restoration can provide complete restoration and renewal of these spaces. We will refresh the environment you live and work in. Mend can enhance your existing planters, foundation walls, cast-in-place benches or concrete stairs through coloured stains, polishing, or micro-abrasive cleaning. With our sister company, Stone Design, we can provide polished concrete floors for new construction, or resurface existing interior or exterior concrete slabs. Szolyd Development , our other affilate company, can provide precast counter tops, benches, stair treads, planters and a range of sculptural art. We are proud of our family of partnerships and excited to be able to offer timeless design, extremely durable materials, and cost effective solutions. FAÇADE RESTORATION UPDATEWe’ve been busy at Trapp+Holbrook meticulously rebuilding the striking terracotta and brick façades to their original glory.